I've created this topic area for us to use as a learning area on how to use this forum. If you want to test out the forum topic and message posting options then this is the place to do it. If we stuff up any messages or just want to try out a forum facility and it doesn't do what you expected then noone will care. Probably better to do it here until you are comfortable posting messages using the railroad-line forum options than in your own building log area. I'll try inserting a picture file for the first time here as well. This is a shot of NA loco 7A leading 6A out of Belgrave at 10:35am on 11 March 2004. At Lakeside 7A will cut off and run back around the train for the return trip to Belgrave on the lunchtime special. 6A will continue up the line with passenger coaches all the way to end of track at Gembrook and return to Belgrave in the late afternoon. Hi, Rick, and welcome to Railroad-Line Forums. The other way is to first upload your photo/graphic file to a web server such as a personal web site or an online photo hosting service and then download it to your post using the "img" and "/img" tags. Thanks heaps for that ... i've been playing around to see how to gwt an image displayed within the message and your tutorial explains exactly that. 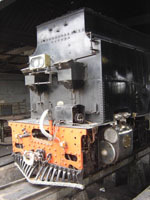 Thanks again for the help and the avanue for us Aussies to discuss the building of this loco kit. A bit off the NA, but for discussion anyhow: I have been building a few skeleton logging cars with the intent of hauling them with the NA. Is anyone aware of NAs being used for this purpose? For interest, they are being made from Meranti (Maple) because I like the grain of the timber. I cut my own timber from leftover pieces of shelving (8" x 1" boards) using a bandsaw, then sand the pieces to size on a bench-mounted belt sander. The timber has been stained using shellac (French polish!!!) and rubbing oil, again, because I like the look. I have yet to add the hardware, bracing etc, but this will be made from brass strip, and then painted either bronze or gun-metal. With a bit of weathering they should look OK. There were two locations that i am aware of where timber tramlines interchanged with the various Victorian narrow gauge lines and NA country. Not sure whether the NAs actually hauled logcars, Keith, but somewhere deep in the recesses of my mind, i recall reading somewhere that there was a trial of an NA onto the tracks of one of these timber tramways at either Erica or Collins Siding on the Moe - Walhalla line where the Tyers Valley Tramway joined it, or at Gembrook on the UFTG - Gembrook line where a timber tramway interchanged adjacent to the current station location. Will have to do a bit more digging around to find out. Great looking log bunks you are making there and i can see why you would be anxious to see if the NAs hauled logs. There was a trial running of a NA from Colins Siding up the tyres valley tramway to Tyers Junction (where the sawmill was). Without doing some more searching to find the actual article, I can't remember what the outcome of this was. Of course the NA's never ran up there in on a regular basis, so it can't have been a good result. Thanks for your comments re: NAs and logging. I figure it takes but one instance of an NA being used for logging and I can legitimately employ mine in that mode. Thanks Gents: you have provided that instance. I am now into logging! Now Prof, where are you? Firstly, my possible memory idea that NA's may have run up the logging lines adjacent to the Gembrook station can't be true as these two logging lines were built to 3ft and 3ft-6" gauges. Secondly, further to the idea that NA's may have run on the Tyer's Valley timber tramway, there appear to have been some trials done sometime around 1933 when the Victorian Forest Commission needed extra motive power while the Climax was undergoing one of its many repair layoffs. The Tyers Valley line was built to 30" gauge but the minimum radius curves were built to about half those on the Narrow Gauge "mainline" which severely restricted the 8ft-long rigid driver wheelbase NAs somewhat. Of course, the Climax (reputedly the last engine ever built by that company and exported to Oz) had no trouble with tight curves. Irrespective of that, the gauge widening and suprelevation on these sharp curves was sufficient to allow the NAs to traverse the trackage except for the bridges which would have had to be strengthened to take the extra weight of the NA engines. The trial NA was more than likely 14A. It appears that nothing further was done about using the NAs on the Tyers Valley tramway, but there is more than enough "could have"s and "maybe"s to have your 3ft gauge NA hauling logs, Keith. I don't think that it would have taken much evidence to convince you to haul logs behind an NA though, would it?